I don't want no longer have to be extra careful when picking berries. I'd also like to choose the varieties that don't need to be sprayed with insecticides, to grow gooseberries the healthy way - no spraying, to know that my berries are completely safe and organically-grown. My wish was to only plant gooseberry, then pick berries, large numbers of sweet, delicious berries. Well, I'm happy now because I have chosen highly adaptable gooseberry bush grown in St. Petersburg area conditions. It's the Pavlovsk' nursery, where selectors have bred thornless bushes. I liked the variety 'Serafim' that combines the thornless, high winter hardiness and resistance to powdery mildew, good productivity. 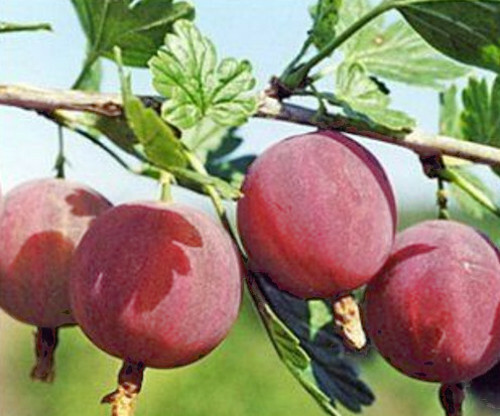 As the author of bred gooseberry writes 'Serafim variety is characterized by an average ripening period, berries are medium, red, with dessert taste. A great advantage of this variety is practically bare shoots. Single small spikes are found only in the lower part of the shoot'. 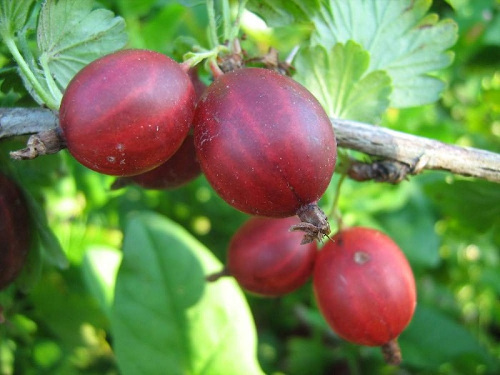 I will order two gooseberry bushes 'Serafim' in March, as the nursery recommends. I hope they come safely to me. Do you have any berry bushes in your garden? Have you a problem with thorn branches? Those gooseberries look absolutely wonderful. I remember when I was a child a neighbour had several gooseberry bushes and used to let us eat them at will. I am sure we got scratched a few times, but it was worth it! You had a kind neighbor, David. These sweet berries worth a few scratches. Beautiful fruits, this is a plant I never saw in person, I think they wouldn't like my climate. Sounds perfect! You were lucky to find them in your area. Hope they do well for you next summer. So do I, Betty. I specially found gooseberry bred in our area, there are many berry bushes sold here from other regions. Tengo varios arbustos, frambuesas, zarzamora. Los arándanos y grosellas se secaron ( pero tengo que volver a plantar ) Besitos. Me da lastima que perdiste las grosellas y arandonos. Parece el verano fue muy calor. They looks so good and tasty. Wonderful color on the berries. Hola Nadezda, yo tengo estas Grosellas y no me molestan sus espinas, también tengo los arbustos de Grosellas que no tienen espinas y para que no sufran mucho con los mohos los tengo alejados de los rosales, porque si están cerca las royas prosperan con mucha más facilidad, preciosas fotos. Un beso y feliz fin de semana. Gracias, Lola, no sabía que los mohos se pueden transferir de rosales a arbustos de bayas. Plantaré grosellas en otro lugar del jardín. Anne, I'd like they have no thorns, it's good you have the same gooseberries I dreamed. Hyvä löytö. Meillä on myös puutarhassa karviaispensaita. Niissä on ihana maku, mutta piikkisyys hieman haittaa. Do they have bitter taste? I have to read attentively about this variety, Kruunu Vuokko. It's a better way to remember the gooseberries, Lisa. I love gooseberry pie and jam as well.This spring I want to plant the thornless bush as your Mom had. We have red and black currants and some gooseberries. 'Lepaan punainen' is our favourite gooseberry cultivar nowadays. Thanks Sara for information, I will see this variety in catalogs and maybe in Finland. Grazie per le informazioni, buona Domenica e buona settimana! Congratulations on finding thornless gooseberry bushes, Nadezda. I hope they arrive safely and produce well for you. Spring must be near when plant ordering begins. I do hope as well, Peter. Actually the plants arrive during 2 weeks after ordering. Those Gooseberries sound marvelous Nadezda and hopefully they will grow nicely for you. It's always fun awaiting plants in the mail. Enjoy! I hope they come at time, Lee and I receive the same variety I ordered. I have dug up all gooseberry bushes, red and green. After my husband died I realised that I have never liked to eat gooseberries. He used to make gooseberry wine with them and only sometimes I used them in a crumble (an English pudding). I don’t miss them either. You can tell how little I like them: I still have a large bag in my freezer from 2 years ago. Dear Friko, thanks for your comment! I use frozen gooseberries making a compote or a drink in hot time. I love gooseberry's taste Giga. Why to dig it out? Let it grow and enjoy berries. I think those gooseberries look absolutely wonderful. Yes, Jan gooseberry jam goes well to pies and puddings. Yummy! Se ven deliciosas Nadezda. En el huerto el año pasado sembramos ciruelos, esperemos que den fruto. Te deseo una buena cosecha de ciruelos, Laura. I have a gooseberry bush which produces dessert berries, quite large and almost yellow. They do unfortunately have long thorns. But they produce a good crop and I have become quite good at picking the berries without getting pricked! My main problem with the bush is that it spreads so much, it is starting to take too much space. If I remove it, that will be the reason. Jenny, gooseberry bushes are mostly wide, they need a space. When I chose a place for my new greenhouse, I did not pay attention to the gooseberry, planted nearby. Last autumn I had to prune it, because its branches pressed against the wall of the greenhouse. This is a problem, you are right. I also think to remove this bush. Serafim sound absolutely ideal Nadezda. I hope it does well for you. So do I Alistair, thank you. Currants are not given in my garden, but raspberries do. Gracias, Tania, feliz fin de semana. I have one gooseberry shrub in my garden. I like gooseberry fruit very much, but picking fruit is problematic! Nadezda - Citrus trees also have nasty thorns.